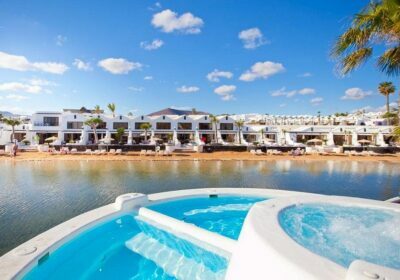 Sands Beach Resort Free Child Places Costa Teguise Lanzarote Low Deposit Family Holidays @Web2travelDeals. Online Since 2000. This popular 3 star Costa Teguise family holiday accomodation has a great location on a private beach, behind the hotel. The Sands Beach Resort is a brilliant family friendly complex with a range of swimming pools for fun in the sun. Food is good quality. Many guests return year after year. Very clean and relaxing. Plenty of space around, so never appears to be overcrowded. Rooms are in need of a little modernisation, but are well equipped and kept very clean. 15 minutes walk to the main centre of Costa Teguise. Claim your Free Child Place Now for Sands Beach Resort Costa Teguise Lanzarote. The hotel is located by its private beach and is 16km from Arrecife Airport. All accommodation features a private bathroom, kitchenette, TV, hairdryer, telephone, minifridge and outdoor dining area. For an extra level of beachfront enjoyment, try one of this property’s Superior Beachfront rooms. These rooms enjoy stunning views of golden sands and are just a few steps away from the glorious Lanzarote shoreline. The hotel features multiple swimming pools and sun terraces with loungers. Sports facilities include a gym, bicycle hire, some watersports and a tennis court. (Please note that some activities may incur an extra charge). Meals are served in a buffet-style at the hotel’s main restaurant, lunch is available at the pool bar and Lido’s restaurant offers seafront dining in the evenings. Prefer Hotel Only or Flight Plus Hotel?